Are you searching for an interesting and user-friendly circuit diagram maker online tool for your academics or professional work? then the best tool for circuit diagram making is a draw.io. Diagrams available on this blog has been created using this tool. It’s a free tool and one can use this tool to draw any kind of electrical circuit diagrams. You can also edit the circuit you did previously use this tool, just make sure to save the .xml file. Let us see how to use this free circuit diagram maker in detail. You will be getting a screen similar to the below image. Then you can find lots of templates on the left side or else, you can choose a “Blank Diagram“. project for editing purpose, click ” already existing project”. You can start creating your circuit diagram by using the tools required for the circuit diagram on the left side. Just play with tools and create circuit diagrams with professional Quality. If you are familiar with the MATLAB simulation software, then most of the process is similar to that. Just drag and drop the required symbols. To rotate the symbol, use Ctrl+R. You can also duplicate and edit, the symbols if you require the same symbols more time. The last step is to save the file. You are working with existing file choose the save as option. There are other methods like exporting to drives with a simple a click. You can find those options under the file menu. Open From – Tab will open where you can choose the required option. Open Recent – Use this to open a recent file. Save – Clicking on this will save your file. Save as – To save again the already saved file. Refresh – refresh your page. Rename – To perform renaming operation. Make a copy – Provide you with one more copy. Import from – Import your file for editing operation. Export – Export your file to a various file format like Png, Jpeg. Print – Print instantly a physical copy. Note: Always save a .xml copy of your created file so that you can edit later. 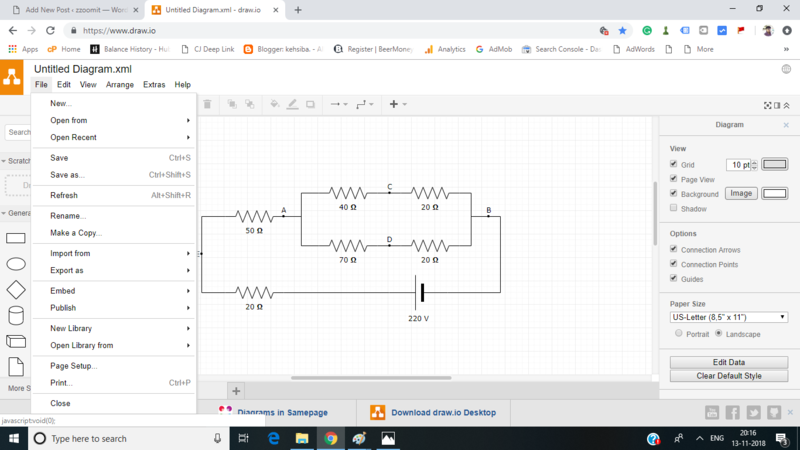 This circuit maker online is one the best tool for drawing circuit diagrams. This tool can be accessed at free of cost. Various options for exporting and Importing. 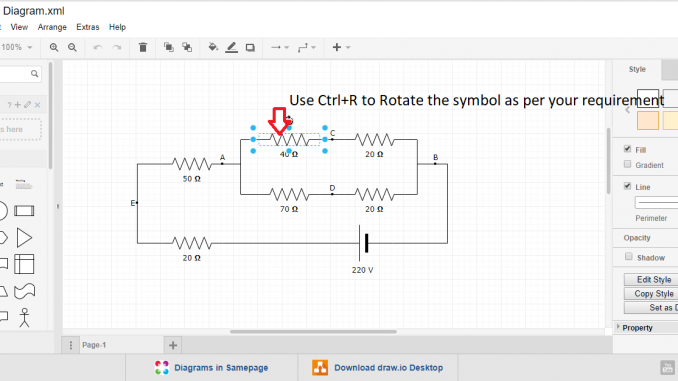 The best tool for drawing an electrical/electronic circuit diagrams and also flowcharts. User-friendly tool, even a newbie can create professional diagrams. The templates, tools, and symbols for drawing electronic diagrams (Especially Drawing Integrated Circuits) are limited. Don’t forget to Share your feedback and experience on using this free circuit diagram maker online. I am sharing my own experience on using this tool and I am not doing any promotion.